Buckeye Valley’s Hannah Cowan drives by Pleasant’s Erika Linder (32) during the first half of Tuesday’s MOAC showdown in Delaware. 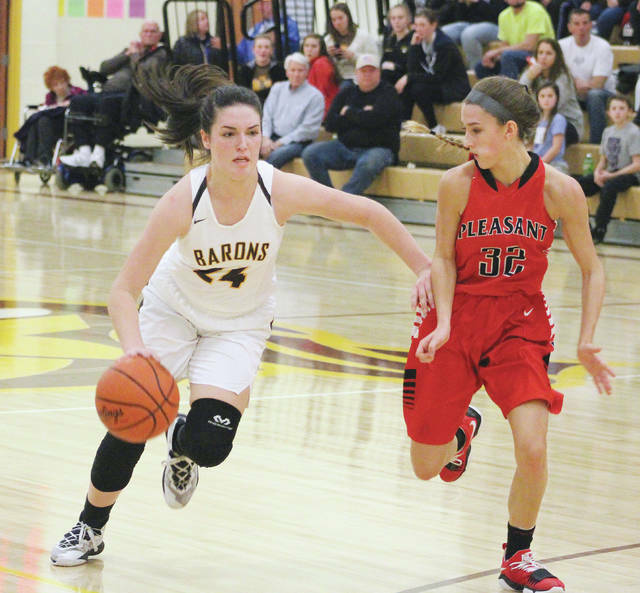 Lisa Leienberger’s steal led to a pair of free throws with 30 seconds left to give the Buckeye Valley girls basketball team a 42-40 victory over Marion Pleasant in MOAC action Tuesday night in Delaware. The win gives the Barons their first win over Pleasant since Jan. 11, 2014, snapping a seven-game losing streak, including a 42-33 decision earlier this season. Leienberger stepped in front of a pass on the defensive end before being fouled on the breakout. She knocked down both free throws to break the tie and keep BV in play to finish second in the league behind champion River Valley. “(Stout) told me to face guard and somehow it just happened … I just stepped in front of the pass and we collided and I just grabbed it started to go,” Leienberger said. Pleasant’s Leah Maniaci knocked down a pair of free throws to tie the game 40-40 with 0:59 left. Carlie Craycraft and Ashley James each knocked down three-pointers on back-to-back possessions to give the Spartans a 32-29 lead with 5:18 left. Hannah Cowan found Leienberger for a basket to cut BV’s deficit to one, starting a 6-0 spurt with a pair of free throws and a basket by Scowden to give BV a 37-34 lead midway through the final frame. Maniaci and Linder each knocked down a pair of free throws to give Pleasant a one-point lead. But, Scowden knocked down a step-back three to give the Barons (15-6, 9-4) a 40-38 lead with 1:14 left. Scowden led with 13 points, including seven in the fourth quarter, and Leienberger and Alaina Radcliffe added eight points apiece to pace the Barons, who have won six straight and 11 of their last 13. BV jumped out to a 5-0 lead on a Tess Hughes free throw and baskets by Scowden and Radcliffe. The Barons pushed the lead as high as six before James hit a pair of three-pointers sandwiched around a Linder basket to give Pleasant its first lead at 16-14 with 5:07 left in the first half. Alaina Radcliffe answered with a three to give BV the lead again on the next possession and the teams would stay within a possession of each other for the remainder of the half. Two Scowden free throws gave the Barons a 19-18 lead at the break. Pleasant opened the second half 8-2 to take a five-point lead – its largest of the game. But, BV responded with a 6-0 run to take the lead again. The teams stayed within a possession of each other the remainder of the way. Linder had 13 points, Meniaci added 11 and James chipped in nine on three treys to lead the Spartans (15-7, 8-6). BV wraps up league play and the regular season at home against Clear Fork Thursday night at 7:30 p.m.